Donald Trump’s trade war with China could cost Iowa farmers hundreds of millions of dollars and do untold damage to the state economy. But you’d never know it from talking to Republicans at the recent state GOP convention here. When Iowa Republican Party Chairman Jeff Kaufmann asked more than 1,100 delegates a defining question — who was still behind President Donald Trump? — there was no hesitation. In an exuberant display of unity, more than 1,100 delegates sprang to their feet, whistling, cheering and offering prolonged applause. Far from being panic-stricken, Iowa Republicans remain committed to the president as negotiator-in-chief. They’re convinced they have a direct line to the administration, the result of 18 months of careful White House cultivation in this early presidential state. The article goes on to cite all sorts of evidence that the Trump administration was paying attention to the potentially heavy negative impact of Chinese soybean tariffs on Iowa, and would presumably find some way to get the politically pivotal state out of the line of fire. And if all else failed, Iowa Republicans appeared to believe, there was their trump card on Team Trump: good old Iowa-governor-for-life Terry Branstad, the president’s envoy in Beijing. Ol’ Terry wouldn’t let anything bad happen to the folks back home, would he? Now maybe something will soon happen to mitigate the damage. But it’s also entirely possible that Terry Branstad has about as much control over collateral damage to Iowa from Trump’s trade policies as you or I have, and that all those confident assurances Iowans were receiving from Washington were just Trumpian hype associated with the belief that Beijing would fold its hand, leaving POTUS as the undisputed master of global commerce. The grim reality is otherwise. China buys at least 60 percent of the Iowa soybean crop. The pain will only get worse if harvest time comes along with the trade war still raging, and there’s no particular reason to think it will be quickly resolved. 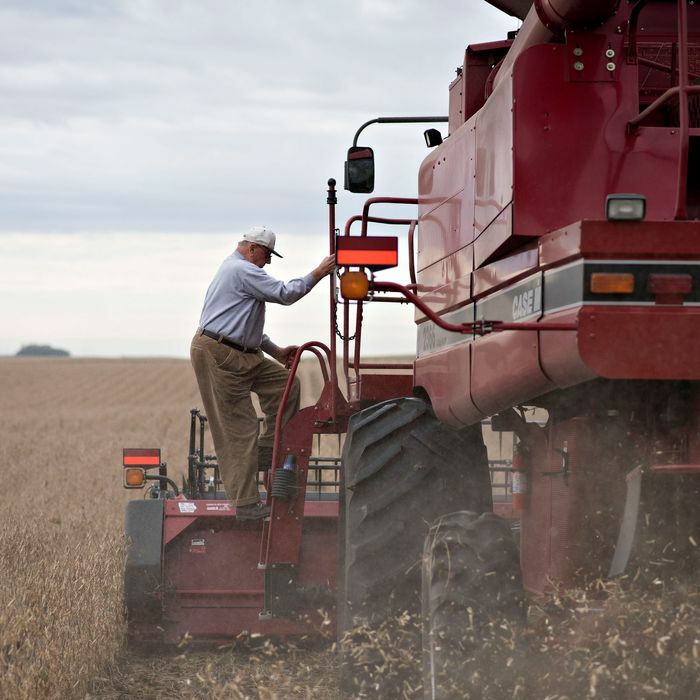 Harvest time is also when this year’s midterm election campaigns will heat up. And Iowa Democrats have already been looking forward to the opportunity to reverse some of the losses that afflicted them in 2014 and 2016, with competitive races in two House districts plus the governorship that the aforementioned Branstad left in the hands of his untested protégé Kim Reynolds. Of the six states that flipped from Democrat to Republican in the presidential elections of 2012 and 2016, Iowa’s had by far the largest shift in popular votes: from D+6 to R+9 (Ohio was second with a net 11-point shift). From being a classic battleground state for years with most recently a distinct Democratic advantage (Obama carried it by 8.5 points in 2008), Iowa was suddenly more Republican than Texas. (This was particularly astonishing because Iowa was one of the few states Trump lost in the nominating contest.) The GOP also won undivided control of Iowa’s state government for the first time since 1998. Add in the outsize attention Iowa will get (because it always does) as the launching point for the 2020 presidential contest, and it’s clear a big stumble there by Republicans in November would be damaging, especially if Trump’s trade war gets the blame. And it would not just be a matter of the state experiencing a dent in the robust economic growth it has been experiencing recently: Iowans could be persuasive witnesses to the fact that it’s dangerous to take Trump’s promises seriously, much less literally.